Sara had the great fortune to sign with a fantastic agent, who was quick to point out to her that her current website seemed outdated and didn’t highlight her work and her goals correctly. 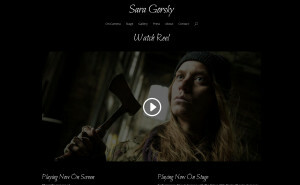 Sara needed a new website that she could really highlight her accomplishments, new bookings, and cool media clips in. The result is a website that cleanly organizes the breadth of her work, and incorporates all kinds of media to reflect her skill level and her accomplishments. Her agent was very happy with the result!